Military Challenge Coins: Are Military Coins Worth Collecting? Challenge coins are not really coins per se. They are not made by the U.S. Mint — instead, they are made by private minting firms. And they are not used as currency. 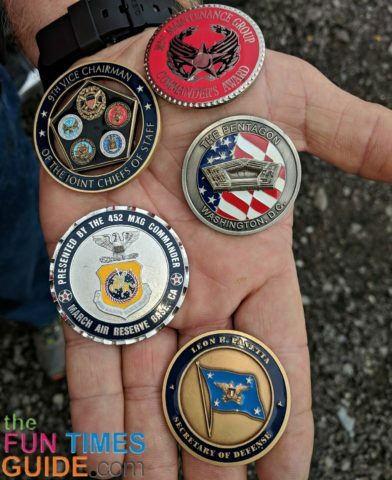 Challenge coins are small medallions or novelty pieces that carry the name or logo of an organization and also bear an emblem or insignia representing that organization. They were traditionally issued to members of organizations when challenged to prove membership (sort of like an ID card), and they are often carried by members of the military. Challenge coins first made their appearance during World War I. They are still issued by many organizations and fraternities today. They are widely popular collectibles. Each member of a particular WWI airborne squadron was given a bronze medallion by their lieutenant. One of these soldiers was captured by the Germans and later escaped, only to be re-captured by the French. The French, not knowing that the soldier was a friendly American, were set to execute him. But before the time came, one of the Frenchmen recognized the medallion that was worn by the American and his life was spared. Why Are They Called Challenge Coins? Following World War I, it became a growing tradition to carry these medallions, or coins. It was a fun little game that gave them the name “challenge” coins. Squadron members would challenge one another to reveal their coins. If the member being challenged did not have their coin on them, they would have to buy a drink for the person who challenged them. If, however, they could produce the coin, then the challenger had to buy them a drink. Thus, the “challenge coin” evolved. These days, challenge coins are everywhere! It may not seem like it, if you’re not particularly looking for them — but today they are used by police departments, fire departments, colleges, fraternities, special clubs, and more. Just type in challenge coins on eBay and look them up. There are hundreds! View many types of military challenge coins — and more here. Are Challenge Coins Worth Collecting? Most coin collectors don’t collect challenge coins. A few may, but not the majority. 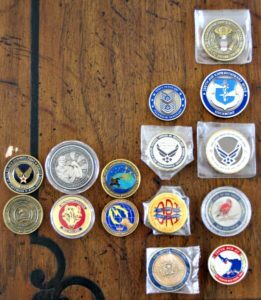 Still, a number of people do collect and trade challenge coins, just for the fun of it — especially military challenge coins. Challenge coins aren’t worth a whole lot, maybe a few bucks each. However, they can still be fun to collect. 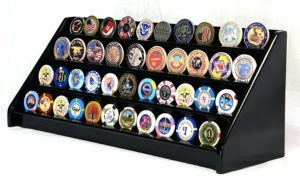 There are even a few really good looking display cases for storing and displaying your challenge coins. You may also be interested to know that you can have your very own challenge coin! That’s right… isn’t that neat? At some places, you may be able to just write them and describe what you’re wanting and they can draw it up for you.